Coming up to 90 years since the Shamrock V was first built, this boat was a major part of the work of Sir Thomas Lipton. 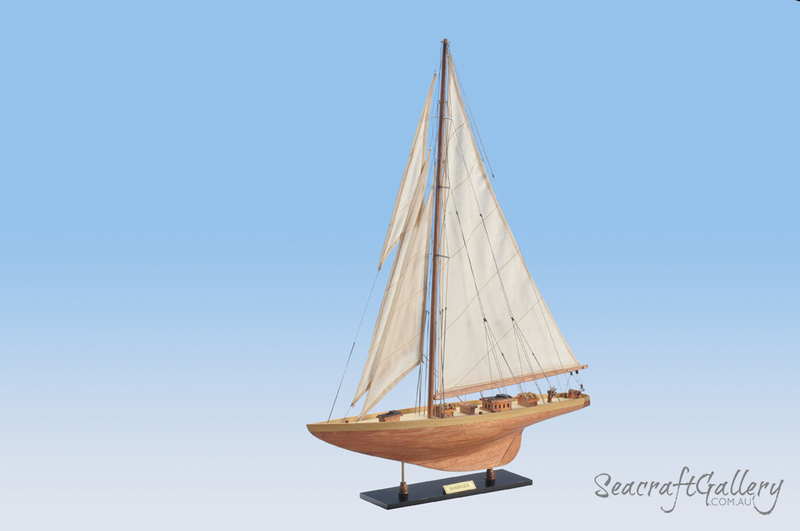 She was the first British yacht to take part in the new J-class rulings and is the only J-class yacht to have been built with wood. Despite having gone through numerous changes and improvements compared to previous models, she was still no match in the America’s Cup against the likes of the Enterprise. Still, to this day, she’s become a bit of a legend in British nautical history. 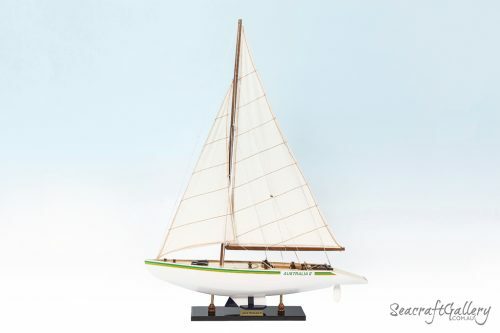 This Shamrock model sailing boat can be an ideal finishing touch to any nautical themed rooms at home or in the office. 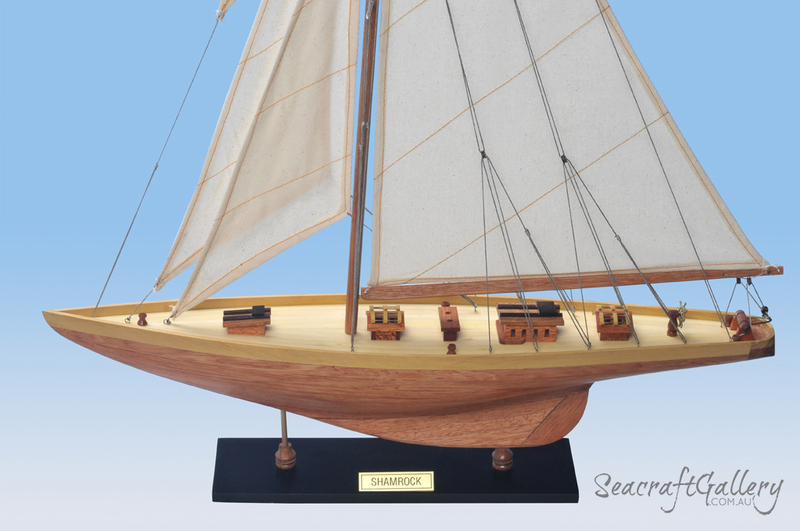 A beautiful, museum-replicate take on the Shamrock yacht with dimensions: 60cm Length x 15cm Width x 82cm Height with stand. Plank on frame construction using quality wood, ensuring that construction feels robust and sturdy. 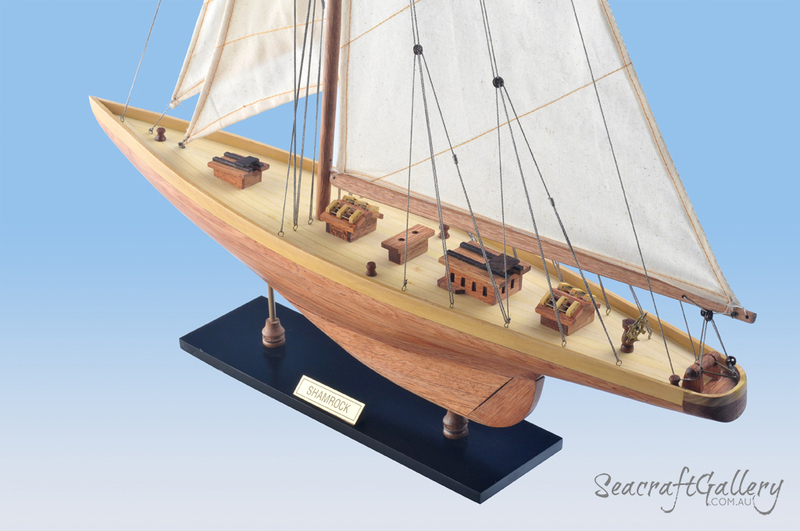 She retains immense accuracy on the materials used and placement of items on the deck and hull. Each plank of wood comes with a visible wood grain that adds an extra layer of depth. Sails are stitched clearly with rigging to allow for an authentic finish. Accuracy comes from the fact that plans, artwork and photos are used for every section. 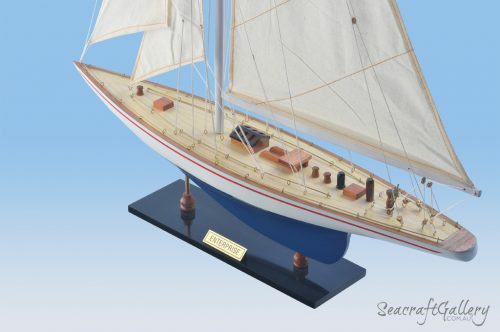 Simple to set-up due to pre-assembly: only the masts need to be put in place with instructions included. 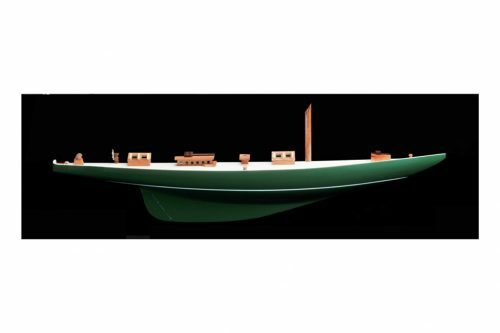 The Shamrock V was the first ever British yacht boat to be built to match the new J-Class ruling. Built for the fifth attempt at wining the America’s Cup by Sir Thomas Lipton, she was supposed to be the one which changed everything. 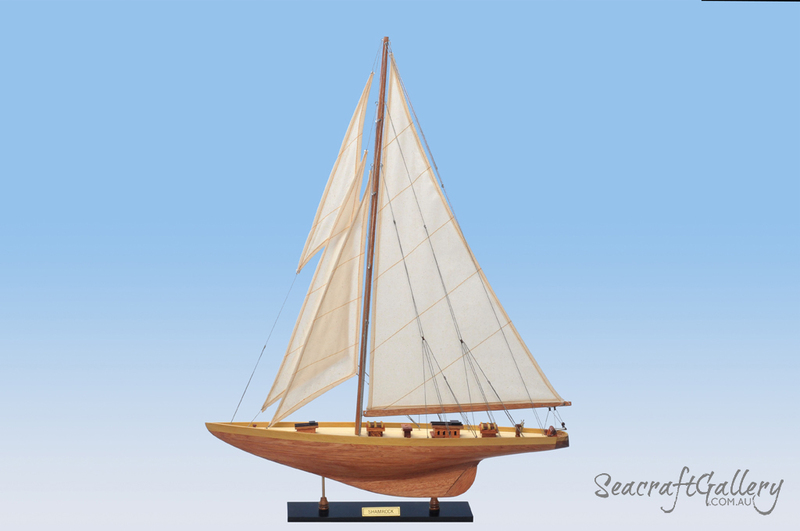 The ship itself was launched on the 14th April 1930, built from mahogany wood on a hollow spruce mast and a steel frame. The Camper and Nicholsons team worked on her over in Gosport, and she became a major part of nautical history. With continuous upgrades and changes, the ship was created to help her reach America for the 15th edition of the America’s Cup. She was to face off against four other J-class ships, including its major rival, the Enterprise. With each of the boats costing as much as $500,000 – sometimes more – she was seen as a gratuitous spending spree in a nation hit by recession. The Shamrock, though, did not meet the expectation and fell far behind the Enterprise, losing by 3-minutes and then, even worse, 10-minutes, in the second race. However, in race three, there was an actual race. While the Shamrock eventually blew its lead, via tackling duel. At this point, the main halyard of the ship became damaged and collapsed – giving her no chance in the fourth and decisive race, with Lipton proclaiming “I can’t win” in response. However, the Shamrock – and Lipton, to an extent – came up against the better boat and expert. Harold Vanderbilt was a legend of the racing circuit, and simply won due to his ability. Sadly, Sir Thomas Lipton died a year later, never fulfilling his dream. She then endured a nomadic existence, being sold to the likes of Sir Thomas Sopwith as a trial horse. She was then sold on across to other people such as Sir Richard Fairey, Mario Crespi and Piero Scanu. The ship was reborn under the ownership of Scanu, with the hull and deck being fixed up alongside modernising of the systems and the ship engines. In 1986, she returned to its original owner in the form of the Lipton Tea Company, when she was donated to the Museum of Yachting, Newport. 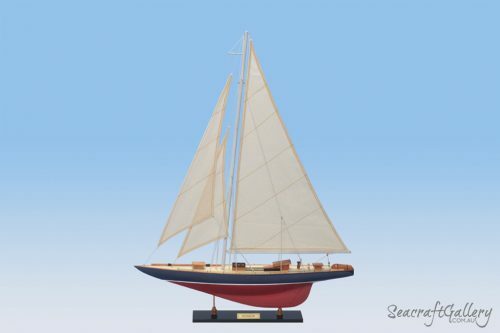 In 2001, the Shamrock V came up against the only two then remaining J class ships, the Endeavour and the Velsheda, for the America’s Cup Jubliee tournament. To this today, the ships durability has been shown to stand out amongst the rest. In fact, she’s the only J-class yacht to have never fallen into total dereliction. She has, though, undergone numerous fittings and changes over the years. She was last seen in 2018, looking reborn once again with a refit of the paint and impressive modern furnishings. 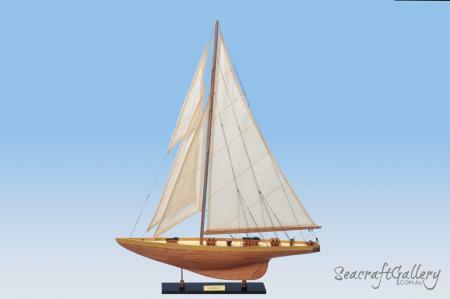 Even to this day, she’s still seen as a fine example of a different era in nautical sport.